This biography has been brought together by her son in law Douglas M Knight – ‘brought together’ because it merges many different sources: Balasaraswati’s own narration of her life and her musings on the methods of making dance and music, along with the memories and observations of her family and many of the people she danced or worked with in her fifty-year career – including her instructor Vedantam Lakshminarayana Sastri who had such great physical control that he could apparently ‘sweat on command’ or even change the colour of his skin. It is a careful collection of anecdotes like for example her deep faith in her local goddess Karumariamman It also stresses on the reasons behind the family’s move to the US and the role she played in the Wesleyan College and how she trained her students and her daughter Lakshmi on foreign shores, striving to keep a tradition alive in a place that its founders would never have dreamt of. Knight is not only Balasarawati’s son in law, but he is also one of the few non Indian practitioners of Indian classical music who manages to sound completely Indian. He was trained in the mridangam first by Balasarawati’s brothers and then by the dancer herself. This gives him an insight into the whole situation of how performance and the ability to present a pure unadulterated form respecting the traditions that gave it birth affect the life of a musician. While his narrative stays simple, as a family member, he has the privilege of having greater insights into Balasaraswati’s life than a normal biographer would. Through his account of Balasaraswati’s grandmother Veena Dhannamal and her family, he delves into the far from simple roots of Carnatic music across the last two centuries. However at no stage does he attempt to canonise his subject – something that many biographers confronted with icons do. It is of course the first complete biography of this seminal performer and the book has a collection of images of historical importance and photographs taken by distinguished photographers in both black and white and colour of Balasaraswati’s performances making it a covetable item both for the collector as well as for the lover of music and dance. 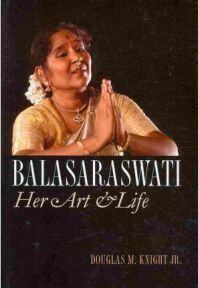 No Comments on "Balasaraswati: Her Art and Life"